Jesus talks about acts of omission in a parable about the sheep and the goats. The goats were guilty, not of doing wrong, but of not doing what was right. Their failure was a failure to act. Jesus even gives specific examples: a failure to feed the hungry, a failure to provide water to the thirsty, a failure to show hospitality to the stranger, a failure to give clothes to those in need, and a failure to look after the sick and imprisoned. Each of these are huge issues—and overwhelming—but enormity is not an excuse for inaction. While one person can’t solve all of these issues—or even one of them—each person can do something, be it simply to help one person who is hungry, thirsty, homeless, needy, or hurting. 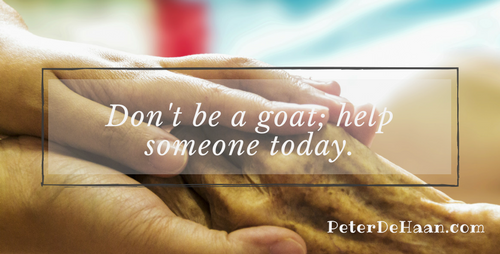 Don’t be a goat; help someone today.